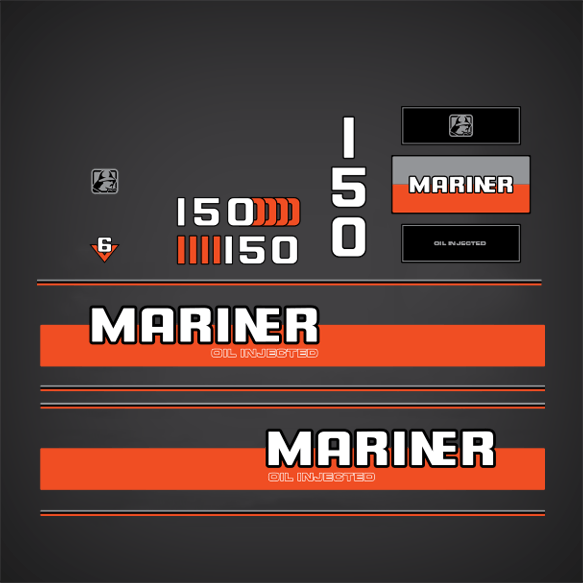 Mariner decal set replica for 1984-1989 Mariner 150 hp CD Ignition Oil Injected outboard motor covers. 1981 1985 Mariner 150 hp ELPT: 1150325 ELPT, 7150325 ELPT, 7150620 ELPT, 7150622 ELPT, 7150625 ELPT, 7150629 ELPT, 1150620 ELPT, 1150622 ELPT, 1150623 ELPT, 1150624 ELPT, 1150625 ELPT, 1150628 ELPT, 1150629 ELPT, 1150824 ELPT. 1981 1985 Mariner 150 hp EXLPT: 1150640 EXLPT, 1150642 EXLPT, 1150643 EXLPT, 1150644 EXLPT, 1150648 EXLPT, 1150649 EXLPT, 1150345 EXLPT, 1150844 EXLPT, 7150640 EXLPT, 7150642 EXLPT. 1981 1985 Mariner 150 hp ELPTO: 1150724 ELPTO, 1150725 ELPTO, 1150765 ELPTO, 7150724 ELPTO, 7150725 ELPTO, 7150765 ELPTO.